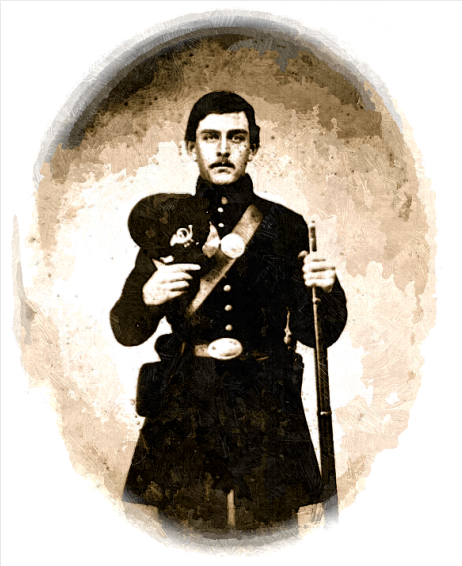 Charles L. Hewitt (1844-Aft1919) enlisted in the Union Army on 27 August 1861, was mustered on 7 September 1861 into Company E, Connecticut 7th Infantry Regiment, and was mustered out on 12 September 1864. Charles was the son of John and Eliza (Platt) Hewitt of West Winsted, Litchfield County, Connecticut. The University of North Carolina at Chapel Hill contains a collection of 31 letters written by Charles L. Hewitt to his parents and siblings and a notebook in which Hewitt recorded the fates of nearly 120 of his fellow soldiers, including those who were wounded, killed in action, promoted, or deserted along with the dates and locations of these occurrances. Hewitt’s letters, written onboard a gunboat and from various locations in Georgia, South Carolina, and Virginia, document army life; his evaluations and speculations; his time drilling, serving in a boat infantry, and picketing; descriptions of his surroundings; family and social news; and descriptions of fighting. The University of South Carolina’s Manuscript Divisions has six of Charles L. Hewitt’s letters written between January 1862 and November 1863. After mustering out of the service, Hewitt returned to Connecticut where he worked as a carpenter and farm laborer, raising two children with his first wife, Jennie, whom he married about 1868, and two more children with his second wife, Charlotte Lawrence Sage, whom he married in 1879. Charles wrote this first letter to Samuel Lloyd Andrews (1811-1882) of Winsted, Litchfield county, Connecticut. Samuel was a 50 year-old master carpenter in Winsted who had previously employed and boarded Charles with his family. Samuel’s son, George L. Andrews (1840-1907) married Sarah Jane (“Jennie”) Fenton (1842-1908) before the Civil War; he enlisted in 1862 as the Orderly Sergeant of Co. F, 28th Connecticut Infantry (having previously served in Co. F, 2nd Connecticut). Charles tells Samuel that the regiment has just returned from an expedition that attempted to destroy a part of the Charleston and Savannah Railroad near Pocotaligo led by General Terry. 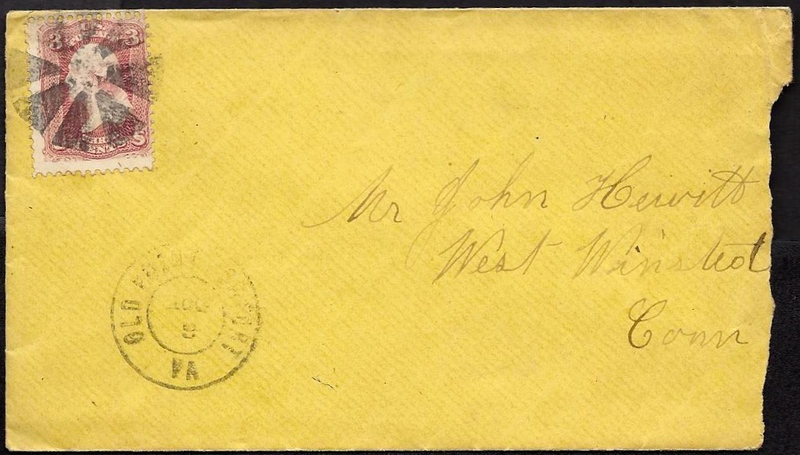 Two days after this letter, the regiment left Hilton Head for Beaufort. I received your letter and should have answered it before but we had to go off on our expedition and when we got back, we were pretty much tired out. I hope you will excuse me this time and I will try and answer your next letter sooner. I sent you a paper the other day that is printed here with an account of our last fight in this part of the country. I sent you $5 through our folks. I sent it to them because I could send it all together. They will hand it to you and I will see that you get the rest before long. Heard that George had gone out as Orderly Sergeant. Is that so? Wheelock [T. Batcheller] has been promoted to Lieut. Col. [of the 28th]? If we get reinforcements down here, you will hear some good news from this quarter before long for we have got a man at the head of the department that means [to] fight—Gen. O. M. Mitchel. We cannot muster more than 5 or 6 thousand men to start off with here now but he has started us twice already—once to Florida and once for the railroad between Savannah and Charleston. George—or Lengthy as we call him here—is well and getting along first rate. He says he will write to you before long. He sends his best respects and so does Jim. We do not have much to do now for a few days back. We are resting from our labors in the last fight. We get soft bread every day and fresh meat every few days. We are living pretty well now. How does Jennie get along without her George? Give her my best respects and tell Mother Andrews that [even] with all our fresh meat and soft bread, I had rather board with her. I hope this war will close before long for I, for one, am sick of it. Give my best respects to all the folks and save a good share for you and Mother Andrews. I received your letter of July 31st and was very glad to hear from you that you was well as this leaves me at present. I received the box the day before I received the letter. The things came all right except Jim’s and Sterling’s ¹ cheese that was moldy but mine come pretty good. It was moldy a little on the outside. Some of the lemons came all right and some were rotten. Sterling’s rusk were all spoilt. The rest of them were all right except the medicine which did not come at all. We have some very hot weather with very little rain. We are not having duty quite so hard just at present. We have to go on picket once in 4 days and fatigue once in awhile. New potatoes are 8 cts. a lb. That is $4.80 acts. a bushel at the sutlers. Tobacco $1.50 a lb. Milk 70 cts. a can, butter 60. Apples as big as walnuts a cent apiece. So you see we feel the high prices here as well as there. We are not troubled with buying much for we have not seen the pay master yet. We get orders on the sutler though — two dollars a month — which won’t much more than get a good meal. I think I shall have to stop chewing tobacco. It cost most too much. I saw Jonas Leroy ² the night before the fight at Drury’s Bluff. Give him my best respects if you see him again. I hope to dinner within 5 weeks from today — just one month more to serve Uncle Sam in and then I shall bid him good day and tell him I want to settle with him. There is no news here at present. There was very heavy firing at Petersburg the other night but I have not heard how it turned out. ³ There are rumors afloat that the rebels blowed up one of our batteries and made a charge but Gen. Grant found out that they were mining and built another battery in the rear of the one they were mining and removed everything out of it and when they charged they did more than give it to them. I don’t know how true it is though. Give my respects to all enquiring friends. The boys all send their best respects. My love to you and mother and all the rest. Write soon. You won’t have many more to write. ¹ Corporal Sterling D. Milliman served in Company E, 7th Connecticut, with Charles. ² Jonas Leroy (1843-1921) was from West Winsted, Litchfield County, Connecticut. He served in Company G, 117th New York Infantry. Prior to that he served in Co. A, 1st New York Infantry. ³ Charles is no doubt referring to the Battle of the Crater which took place in the early morning hours of July 30, 1864. This entry was posted on Monday, October 20th, 2014 at 12:29 am	and posted in Uncategorized. You can follow any responses to this entry through the RSS 2.0 feed.